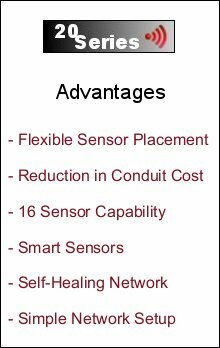 The InsiteIG wireless self-healing mesh network is a multi hop system in which sensor transmitters assist each other in transmitting packets through the network, especially in adverse conditions. You can drop these networks into place with minimal preparation, and they provide a reliable, flexible system that can be extended to 16 devices. 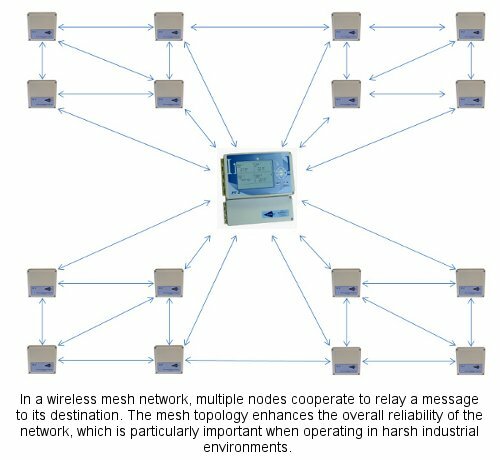 Like the Internet and other peer-to-peer router-based networks, a mesh network offers multiple redundant communications paths throughout the network. If one link fails for any reason (including the introduction of strong RF interference), the network automatically routes messages through alternate paths. In a mesh network, you can shorten the distance between nodes, which dramatically increases the link quality. If you reduce the distance by a factor of two, the resulting signal is at least four times more powerful at the receiver. This makes links more reliable without increasing transmitter power in individual nodes. In a mesh network, you can extend the reach, add redundancy, and improve the general reliability of the network simply by adding more nodes.